Catnip Tea Organic by Alvita Tea 24 Bag Catnip Tea Organic 24 Bag Catnip (Nepeta cataria) a member of the mint family also referred to as catmint is renowned for its ability to drive felines into a frenzy. Interestingly this herb has a somewhat opposite soothing effect in humans European and American herbalists have traditionally brewed tea from the leaves of the catnip plant to soothe an upset stomach. 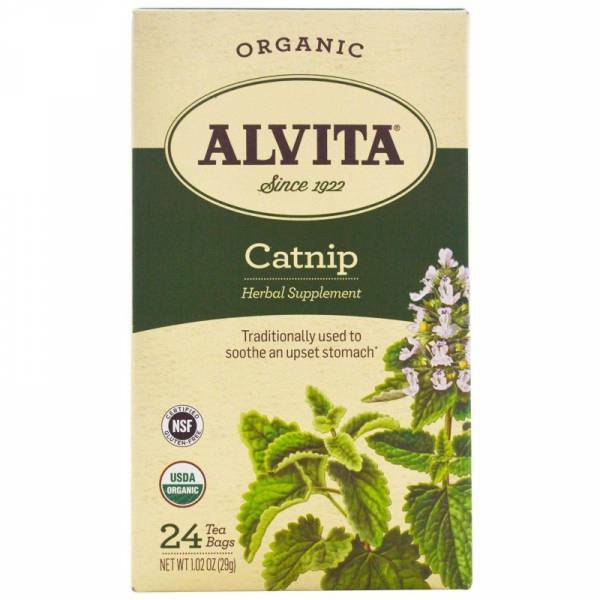 Made with premium-quality organic catnip and produces a savory woodsy aroma and flavor with a hint of mint. Directions Place one tea bag in a cup and add 8 oz of boiling water. Cover and steep for 12 minutes. Gently squeeze tea bag and remove. Warnings Keep out of reach of children. As with all dietary supplements consult your healthcare professional before use. See product label for more information.